FINANCE MINISTER ASAD UMAR MET WITH PRESIDENT WORLD BANK GROUP MR. DAVID MALPASS IN WASHINGTON DC. 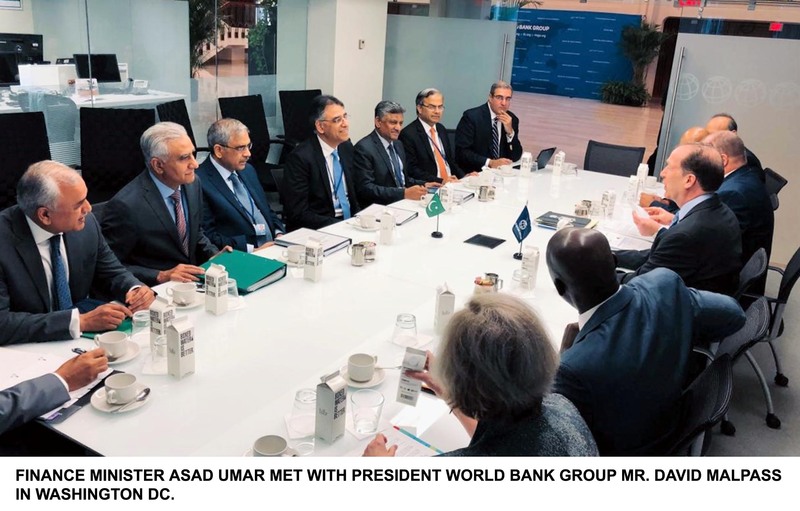 A delegation of Pakistani officials led by Finance Minister Asad Umar held meetings with high-level officials of the World Bank and the International Monetary Fund (IMF) in Washington on Wednesday on the sidelines of the annual Spring Meetings. During the meeting, Malpass appreciated Pakistan’s efforts for reforms and assured that World Bank will continue its assistance. Umar also met with Hartwig Schafer, the vice president for South Asia at World Bank, and was scheduled to participate in a talk with the assistant secretary and acting assistant secretary of the US Treasury. The finance minister met David Lipton, the first deputy managing director of IMF, as well and the two discussed the ongoing talks between Pakistan and the international lender.